I hope you like the show, and Kevin and I love to hear from our listeners. The best place to do that is in the comments, but if you have a question for the show or an issue that isn’t a fit for the comments, drop us an email. Have an IoT question you’d like answered on the podcast? Call the IoT Podcast Listener Hotline at 512-623-7424 to leave a message. We will consider playing the question on the air and answering it. Want to reacquaint myself with you and Kevin. I listened to your former show via Downcast. Can you please share your RSS feed for IoT Podcast? First & Foremost, I am a Big Fan. When wanting to repeat to better understand something, I just press a 15 second rewind button. But, if pressing it 2 or 3 times it will Reboot the Phone consistently. This will happen even on the lock screen. Not a problem if was Streaming. I can’t imagine an audio recording having a macro that would only make your Podcast do this. Very, very, very glad to have you both back on the air. I am asking around to try to figure out if I am doing something, and am going to test on my iPhone to see if I can replicate. My name is Melissa, and I have a client who is very interested in working with you on a podcast sponsorship. The main goal of this campaign is branding/awareness for their current initiative that is running through 8/3. Can you send over some basic info on pricing? This is something they want to launch as soon as possible. Thank you! In the podcast about the Echo and the GE Link bulbs you described using the Hue app. Does this required the Philips Hue hub or can it be done with the app alone. I have a Wink hub and the Echo will connect to Wink but your description seems more streamlined. Thanks. So the GE Link bulbs have to use either the Wink or the Hue hub to talk to the echo. I link the Link bulbs through my Hue app and then the Echo “finds” them over the Hue. I want to try hooking them up via the Wink, tho because the lights can be a bit iffy sometimes and I wonder if it is the choice of path that makes it so, or it is the lights themselves. On the most recent episode you glossed over the Salesforce IoT cloud announcement. Which is fine, you had other more interesting things to discuss. But, i want to mention that I saw the online video presentation of the ‘IoT cloud’ service and their ‘use cases’. It struck me as quite interesting in fact for manufacturers/servicers of consumer connected devices. An interesting platform that makes it easier for the provider to create rules, actions, etc as a result of the device activity and user interactions. You frequently highlight the difficulties of setting up/managing/integrating the devices; this new offering seems to address some of these issues. Just thought i would share my 2 cents. I love your show and I really liked the nightline piece. I too have a smart home and I spend way more than one hour a week on it. My house was built with most of the wiring going directly to the main electrical cabinet in which I have 80 relays and contactors that I use to control lighting and blinds. This uses a proprietary system that has a web interface and I built a lot of automation around it using apps and Python scripts that I wrote. I am also using iTach IP2IR modules and IR blasters to control my DVRs, Stereo, and AC. Of course I have a home server that runs all this stuff. I have took your advice from the show and tried using IFTTT and was excited about their Maker channel that lets you connect web requests to other channels. But I am disappointed from it because sometime there is a time lag of even 30min between the trigger and the action if one of them is the Maker channel. So now I’m looking into adding some zwave ‘things’ using the SmartThings hub but I don’t want to rely on the IFTTT Maker channel for these ‘things’ to talk to the rest of my house. I am trying to find out if there is a way for me to interface directly to the hub or the ‘things’ from my computer without going out to their cloud. This could be a web interface on the hub or a device/thing that will connect to my computer and provide it. Do you know if such an option is available? Also, note that the second gen SmartThing hub has some intel on the hub so not everything goes to the cloud now. This obviously doesn’t help with IFTTT lag, although you clearly are tech savvy enough to work around IFTTT if needed. On another note, SmartThings does work with Logitech’s Harmony bridge, so depending on the IR system you use for controls, that may also be an option if you ever want to mess with that, although if it ain’t broke don’t fix is was always my motto before i started tearing apart my home on the regular. Hi. Thanks very much for the references. While browsing for more data on these I stumbled on two other solutions: Open Source Automation (http://www.opensourceautomation.com/) and openHAB (http://www.openhab.org/) that interface with Z-wave devices using a Z-wave USB stick. These can also work with my ITach, IR blaster, and EventGhost so I’ll give them a try first. I wanna know it too! The track is a w e s o m e! it is a random track provided by my podcast producer. But I’m glad y’all like it. I am writing a blog for publish next week Thursday 29th Octover 2015. I will have a link in it to your podcast, (amongst other IOT podcasts) and would like to use your brand image for the link to your site. The blog is based on a summary of best IOT sources of information sources as stated by a IOT linkedin community. I had alot of problems with my Smartthings Hub 2 also. I put it in the exact same spot of my hub 1 and it would not connect to any zigbee devices (including he smartthings sensors themselves) After working with tech support, I got a second hub, and had the same issues. That’s when I started to look at things differently. It would connect with z-wave, but nothing else. Not even if the sensor was 6 inches away. So I moved it, and everything worked right away. Seems that my router (or something else) interfered with Hub 2 but not Hub 1. If you’ve not tried it yet, I suggest you do. it’s a frequent request. I just need to do it. Maybe over the holidays. Love your podcasts guys! I hope I can ask a question? I got into home automation with Iris by Lowes (I know smack me later) v1 worked good not great but it worked. Version 2.0 is absolutely horrid from the pain of migration, devices not pairing and the system not notifying me when it was down, it was more of downgrade than an upgrade. I am looking at the smartthings hub because frankly it’s the only other one that I know. Have you used the new version? It seems to work better from the reviews. What I am really worried about losing is the notifications and monitoring. How does smartthings handle that? I loved getting the text alerts etc..does smartthings have a comparable service? Even if it is paid? Jon you must have missed the show where Stacy lamented for her version 1 SmartThings hub. Yes, it turned out she had a defective version 2 SmartThings hub, but she still didn’t sound swept away by it. Guess you also missed the last Episode 42 where Om Malik said the SmartThings hub is “so unreliable they should stop selling it”. This sentiment is echoed in blogs (http://blog.streamingmedia.com/2016/01/smart-things-unreliable.html) and on SmartThings forum alike. I have both Insteon and Wink. Insteon is super reliable, but since you already have the Zigbee and Z-Wave stuff, and most of it should work with Wink, that’s a good option for you. Seriously. Never thought I would have said it after hearing and reading all the bad reviews. Kevin is right. Flex really did a great job on the hardware and it really is reliable. Soon it too will have Local Control according to Wink as reported on IoT Podcast by Stacey. So why not head to Home Depot and pickup a Wink to try. Their company is stable again thanks to Flex and Home Depot is back on the bandwagon with them. I noted the shelves are loaded with new (not returned) Wink hubs at several Home Depot stores around me. Nice thing about Wink is you also get Bluetooth LE, 433MHz Lutron and Kidde for integration with Kidde Connected Smoke and CO Alarms, in addition to WiFi, ZigBee and Z-Wave. 1. Make sure it is at least 3 feet from the WiFi router you are connecting it to. This really is important and it will not connect if you ignore that rule. 2. You have two minutes to finish the WiFi connection setup. Don’t go too long. If you do, unplug and try again when it’s ready. The light needs to be flashing YELLOW when you attempt to connect, NOT Violet like the instructions say. The instructions are wrong. If it’s flashing violet, you’ve waited longer than two minutes and it won’t work. Don’t try to connect without rebooting the hub, it won’t work and you might get frustrated like so many others, return it and then write yet another “Wink is so terrible” blog. Poor Wink. 3. If you have to change the WiFi at any point, be sure to click the “Advanced Options” below the Change Wi-Fi button. Don’t not click the red “Change Wi-Fi” button, otherwise you will have to set all your devices again. I can’t seem to find this podcast on Stitcher. Is is possible I am just not using the correct search criteria? Anyone know about this? William, I had not yet added the show to Stitcher, but now I have applied, so you should see it there in a few days. In the meantime, it is on tuneIn, Spotify, iTunes and Google’s Listen podcast store. I’m attending the Electronic Security Expo (ESX) in Fort Worth this week and there are some really cool security and home automation applications here. In particular the folks at White Rabbit have a smart hub that seeks to be platform agnostic and may provide a solution to the challenge of requiring an additional hub for every new gadget you bring in to your home. (I don’t work for them, I just thought the device was slick.) It immediately made me think of your podcast – it might be worth testing on a future episode. Can you do a Podcast on remote control glass sliding doors for Pets? I saw one online but it is $500 or so, it is basically a motor and gear strip of teeth and some sensors and Remote control buttons. Maybe Raspberry Pi Zero and a stepper motor, cog with row of teeth etc? Or are you thinking of a some type of installed pet door in your sliding glass door that opens and closes? Enjoyed your appearance this week on TWiT.tv’s This Week in Google with Jeff and Leo. Done. Thank you! Hope you like it. Airpods – The market for these $160 wireless ear buds is clearly those that are all in on Apple, people who have multiple iOS/macOS devices. The magic sauce in this product is the syncing feature, not the pairing. Play a podcast on your phone, it comes through the Airpods. Then start a video on your iPad and it just automatically comes through the Airpods. Done with that? Play some music on your Mac and, guess what, it just magically comes across those same Airpods. Pair them with your phone once and they sync to all of your devices automagically, forever. HomeKit – You don’t need an iPad or Apple TV for automation to work when you’re not there. Any iOS device will do. However, you do need one of those two for remote access. Thanks for the clarification on the HomeKit element. Where are the commands stored and issued from for automations if the phone isn’t there? We’re about to start building our new home. Any pointers on what to do with wiring etc. and where would we start with some basic automation. I’m thinking that star wiring all the lights via a central point is the right way to go? and maybe an rfid/ remote entry system. Stacey, just heard you on TWIG (I listen to your IOT podcast and TWIG on Android via PocketCasts) and heard you say you should keep quiet about your opinions. As an older white male I implore you to please keep speaking out. Society needs to hear your viewpoint and you are so articulate and passionate. Even if I disagree with your stance from time to time it is important for me to hear opposing views as it helps me understand others better. I am sorry for those who are so closed in their thinking as to need to attack you and others. It is grievous that our society still has not advanced beyond our basic human state. Keep up the good work and I will keep listening. Thank you. I rarely keep my tech opinions to myself. I am a big fan of both of you since the GigaOm days and love the podcast. 1. The podcast is very U.S.-centric and it would be nice to talk about other countries. To help with that, the state of home automation and IoT here in Israel are in their infancy , the choices are meager and prices are high. And we cannot use U.S. products since the voltage and frequency here are 220v/50Hz while the U.S. uses 110v/60Hz. 2. about the podcast – I love the interaction between the two of you, but it would be nice if you thank Kevin and say goodbye when the first segment ends and you interview (alone) your guest. As for your first question, I’m open to learning more about devices in other parts of the world, but given the realities of the market I can’t get them or test them. If you have specific questions, please share them here and I can also tweet folks who may have information. And if I find cool looking Israeli devices I’ll be happy to share! Love your podcast. Long time listener; first time caller. If you’d like an interesting guest to discuss/debate how and why the Internet of Recognition is magnitudes larger than the Internet of Things, give me a shout. If you where building a new house and already had an Echo. How would you control the lights – dusk to dawn? Z-Wave with another bridge? Just use Insteon so another bridge is not needed? Use a WiFi switch so another hub is not needed? Can you guys please do a segment on Android Things (https://developer.android.com/things)? I’m interested in recommendation for in-wall light-switch that will work with Google Assistant/Home. I’ve the WeMo wall-switch, but unfortunately discovered that it requires neutral wire and doesn’t work wiht 3-way switches. I heard there is Lutron wall-switch that doesn’t require neutral wire, but not sure if it works with SmartThings hub. Where do I go to sign up to download your podcasts as they become available? You can hit subscribe in your podcast app. Usually iTunes on an iOS device or you might use something like PodCatcher. I live in Stockholm and will start a two years course in IoT. Started to listen to the pod a couple of months ago and was wondering what do you think about the IoT World Forum 2017 that will be held in London in November. Would that be interesting for a student to take part on that or should I wait a little more (since it isn’t a cheap investment :/). I guess I am so excited about this IoT world and there is so many events and materials spread out that it feels like I need to take part in everything at once! I will do as you say, try to figure what are my goals and concentrate in them to take the right step! Again, thanks for taking the time to answer! Stacey & Kevin, Fantastic show. Just found you guys a couple weeks ago.would you be willing to address our local alarm association sometime? A lot of alarm, HVAC, A/V, insert type of company here are getting into the “connected home” I don’t think they fully comprehend what they are getting in to or the possibilities of what they can do. 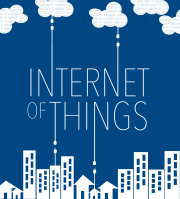 I really enjoy your podcast and appreciate all of your hard work to keep us apprised of trends and reviews in IoT. I’m an episode behind, but wanted to let you know that in Episode 125: Lockstate’s big goof and a super sensor from MIT. The “super sensor” is actually a CMU creation. Gierad is a PhD student in Chris Harrison’s (www.chrisharrison.net) Future Interfaces Group. Lots of exciting research taking place there – if ever in Pittsburgh, please let me know. We would love to host you. I apologize. I even invited Chris out to speak at a conference I hosted at Gigaom after seeing his work, so I should know better. We have fixed the written posts and I will issue a correction in this week’s show. Not sure if you are being facetious in your reply? However, I was interested to know if you had an degree (or relative degree) in CIS and/or IT, it appears you do not. I was seeking collaborative research..i.e., startups, and providing venture capital toward companies that provide SAS, VR, AI and IoT, thus my initial inquiry– about your credentials. I wasn’t being sarcastic. I get that question a lot so I generally try to explain why I am such a nerd. I make alot of IOT/HomeAutomation myselves. I made all my products selves before with Arduiino and Raspberry Pi an sensors. Today I use Arduino, RasPi and products like. And Sonoff’s wifi products where change the firmware so it can work with Mqtt broker and NodeRed. The Life get’s alot easier for us makers/DIY people. I listen to your podcast for getting to know what’s happening in the commercial marked. More and more things from the commercial marked can be used among the DIY product and MQTT. You can make very interesting combinations with af mix of mercantile product and Open Source products. You have a grammatical error in line six of your about me. Yes I read it. Also, I like your,podcasts. Hi Stacey I love your show. You’ve discussed OpenHAB several times on the show and I was wondering if yourself or Kevin have looked into Home Assistant as well? I think it’s another great DIY solution that your listeners might enjoy hearing about. Just wondering if the creepy Alexa laughs might actually be drop-in pranks. Something like that happened to me a few months ago. There was laughing followed by someone saying “sorry”. As far as I could tell what happened was drop-in’s from anyone were enabled on the Echo, and someone I didn’t know had my contact info and used it, either by accident or as a prank. It clearly was a live person in that case but I can imagine creepier versions could easily be done. I was listening to this weeks show and you mentioned Alexa’s new Brief mode, but then Kevin proceeded to describe the new Follow-Up mode. I just wanted to point out that these are 2 different features that both recently became available. As far as I’ve noticed the Brief mode primarily replaces Alexa saying “Ok” with a chime. As a side note, I had went into the Alexa app and enabled Follow-Up mode, but then the following morning, like Kevin’s experience, Alexa prompted me to enable Brief mode verbally. Thanks for the great info you provide each week, Matt. How can I ask google to subscribe to your podcast? I am GP, Systems manager in sensing working in Texas instruments. I really liked your podcast, i am interested in seeing how i can help you/partner to host any of the session.. I have extensive background in silicon implementation/definition/devolopment..Looking forward to hearing more from you so i can have more detailed discussion. Given that you may be broadcasting the message we leave on the hotline, could we leave an audiofile in a “dropbox” instead. Sure, that seems reasonable, although we do edit the files somewhat so your email isn’t broadcast and many issues are taken out. Hi Stacey, Hi Kevin, thanks for taking the time to explore so many products/trends/announcements and share your findings with us. It’s great! In this week’s podcast, it seemed like Kevin had the same issue I did with my Ring doorbell… where it won’t do a hardware reset to initiate the setup process & choose a wireless network. I disassembled mine using the “ring doorbell battery replacement” instructions on ifixit, and disconnecting/reconnecting the battery solved my problem. Curious to know if it solves yours too! I’m an Indian American currently in India. I’m doing a research on modern kitchen appliances and trying to understand how tech (like IoT) is helping manufacturers improve their products. I came across Rotimatic recently, which promotes itself as an IoT-enabled automatic roti maker. Although it is not possible for me to purchase it and find out if that claim is true, I just want your opinion on it. Can you spare some time and share your thoughts on it? Their website is https://rotimatic.com/. Thanks. I’ll see it in action in a few weeks and can share my thoughts then. Would be interesting to hear your comments regarding this article and the problem of regulation of these IOT devices now in our homes. Hi Stacey. I was liking your podcast but it seems like you’re obsessed with Madam A. I hear about it in every podcast and feels like there’s no end. The rest is good but I’m tired of Madam A. Today I came across your website iotpodcast.com, really appreciate your efforts you put into your content. Your writing style is extremely appealing and the content is actionable & promising to titles. I’m also a blogger. Since we both share similar interest, may I ask, do you accept an expert contribution to iotpodcast.com? I want to write an article for Your site. Your visitors will certainly like it. Please let me know if are interested.